It’s probably best to avoid asking a candy maker about her recipes, but I make that mistake while watching Margie Battaglia dip small logs of caramel into viscous, midnight-dark melted chocolate. “So, what’s in there, exactly?” I ask as she pulls out a dripping form and places it on a sheet of white paper. She divulges the source of the caramel, though: Red Kite Candy in Thetford, about a half hour away. 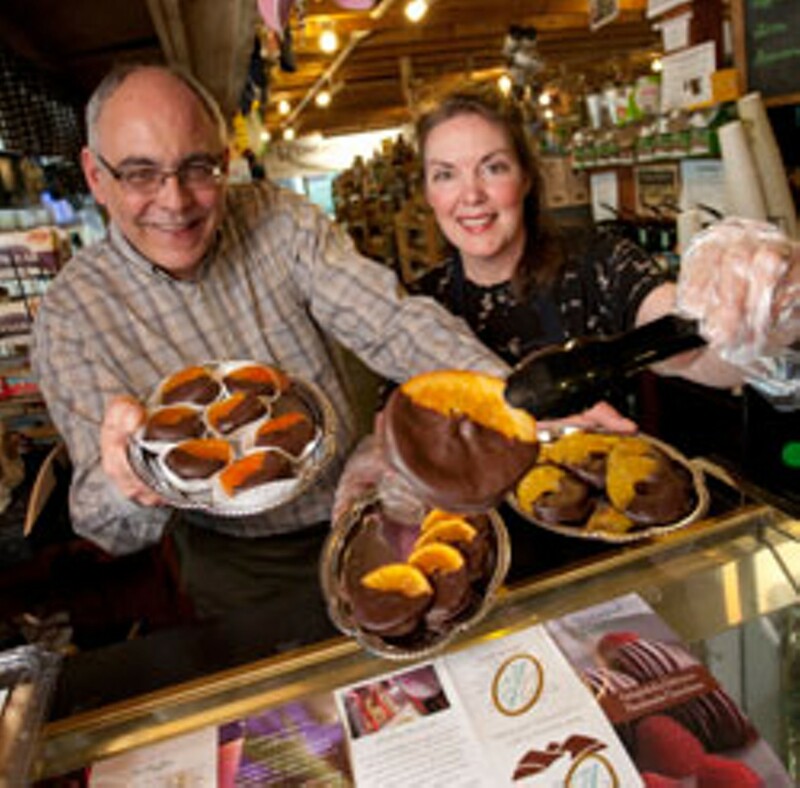 While major producers such as Lake Champlain Chocolates have linked “Vermont” and “candy” in the public mind, boutique candy makers such as Red Kite and Battaglia’s Vermont Chocolatiers are staking out a claim in the Upper Valley — with sweet success. I’m visiting Battaglia at the Route 4 Country Store in Quechee, at the back of an intensely bright room that reeks of cacao. When Battaglia and her husband, Tony, purchased Vermont Chocolatiers from its previous owners a little over a year ago, they didn’t just cart home the molds, massive enrober and two temperers — one for milk chocolate and one for dark — that now line this chocolate-making room. They also purchased a reputable name and the recipes that give it value. “When you buy into the company, you buy into the name,” says Tony. What they didn’t need to buy was a retail space. The fiftysomething couple had purchased the Route 4 Country Store, formerly known as the Ottauquechee Country Store, in 2009. The barnlike building with a long, covered porch attracts travelers headed toward the Quechee Gorge, Woodstock or Killington. Out front, customers can sit and devour creemees. Inside, a hodgepodge of wine, hats, local cheeses, grinders, videos, popcorn — everything you might need for a weekend in the country — shares space with prominent glass cases of housemade candies such as patties, clusters, barks, lollipops, chocolate-dipped pretzels, caramels and chocolate-covered nuts. Margie Battaglia spends part of each day molding, chilling and decorating chocolate behind a wall of glass at the back of the store. She takes heavy blocks of Peter’s Chocolate — a Pennsylvania-based premium brand made for chocolatiers and chefs — and chunks them into a temperer. Here the chocolate is melted at 85 to 90 degrees to ready it for molds or dipping. Battaglia also loads chunks of hard chocolate into the enrober, where they melt and then cover nuts and fruit peels in a dark, wet cloak that eventually dries to a sheen. Chocolate making can seem so simple: melt, mold, chill, eat. But each early step in that process is a tango of temperature and timing. With a gloved hand, Battaglia dips Red Kite caramels one at a time into the temperer, a machine with a wheel that looks like it could nick her fingers. It spins slowly, though, mixing the chocolate to prevent it from crystallizing. So Margie headed to “chocolate boot camp” at Peter’s Chocolate headquarters, and Tony took a three-day workshop at the University of Wisconsin. Both earned certification as chocolatiers. And their secret recipes, they decided, would employ as much Vermont cream, butter and maple as possible. The result is an understated, crowd-friendly product; the milk chocolate is softly sweet and creamy, and the dark chocolate lacks bitterness. On whatever it “enrobes” — pretzels, orange peels, popcorn, peanut butter, caramel — the chocolate’s flavor complements rather than dominates. Tony Battaglia notes that the “all-American classics” — such as clusters and chocolate bark — are perennially popular at the country store. Clusters win hands down, he adds. As if to confirm this claim, a customer sidles up to the display case and begins to scan the goods. After a few minutes, he asks for a quarter-pound of dark-chocolate, pecan-caramel clusters. “See?” says Battaglia with a smile, and slides the candy into a bag. Few sweet treats are more all-American than a buckeye, the humble candy that sent young Elaine McCabe on her professional path. When she was growing up in Eaton, Ohio, McCabe learned to make buckeyes — peanut-butter balls encased in chocolate — and eventually began turning out the candies as gifts. Using real cream instead of sweetened condensed milk made a marked flavor difference, she learned; she also realized that caramel — a gooey mass of reduced sugar and cream — was one of her favorite confections, along with toffee. As McCabe became more skilled in candy making, she would shudder at the mass-market buckeyes that stare from store counters like eyeballs. Three kids and several states later, McCabe went professional, and her meltingly tender caramels and toffee — sold under the name Red Kite Candy and made in her home kitchen in Thetford, Vt. — are now available in the King Arthur Flour Baker’s Store in Norwich, FH Gillingham & Sons General Store in Woodstock and the Whole Foods Market in Hadley, Mass. Her sales have doubled since 2010, and McCabe is now producing several thousand pounds of candy per year. With the help of her husband, Michael, a mapping geographic information systems consultant, McCabe formulated a business plan. When her youngest child, Jack, was about to enter kindergarten in fall 2009, she plopped a trusty pressure cooker bottom on the stove and began making caramel by hand. “For over a year, I made every single batch here, stirring for three hours,” McCabe says, waving at her gas stove. She would position a stool nearby to keep a foot raised while she patiently tended to batches of the sticky stuff. McCabe hawked her caramels at local farmers markets under the name Thetford Hill Candy Company, augmenting her table with baked goods such as cookies and butter-almond cake. When a customer asked McCabe if she could turn out a maple caramel, she did, using syrup from her neighbor. When someone else asked for a dark-chocolate toffee, McCabe brought some to the market the following week. Her candy was so popular that she dropped the baked goods and focused on it exclusively, selling the caramels in local general stores, as well. McCabe had her home kitchen inspected and certified by the state as she added confections such as pecan caramel and sea-salted caramels, harnessing her husband’s help to finesse formulas and temperatures. “He’s got a science mind. He’ll help me develop flavor,” says McCabe. Together, they perfect the balance of texture, taste and the proper amount of sweetness; 7-year-old Jack is a trusted tester. Now, Michael McCabe carts home loads of cream from Strafford Organic Creamery. Elaine also uses cultured butter from Vermont Butter & Cheese Creamery, organic sugar, Nielsen-Massey Vanillas and Belgian Callebaut and Guittard chocolates for her toffee. She gets organic nuts from various sources and toasts them herself; another addition is corn syrup, which is needed to “interfere with the process of sugar wanting to go back to its crystalline state,” she explains. “I could talk caramel all day,” says McCabe as she narrates the process of bringing cream and sugar up to a “certain temperature.” Asked to elaborate, she pauses momentarily and then says with a laugh, “That’s proprietary!” All she’ll reveal is that a higher temperature — such as 250 degrees — yields a harder caramel; McCabe likes hers soft and chewy. Her careful attention to ingredients and slow-food approach to candy making are evident in the caramel, which is sumptuous in its scent and depth of flavor. While sweet, the original formula is buttery, pillow soft and not at all cloying; the maple caramels are darker and smokier. The salted caramels are only slightly granular, but the salt adds an addictive zing that complements the sugars. Red Kite’s toffee is simply out of this world. McCabe coats each flat piece on both sides with chocolate, then sprinkles it with crushed almonds. Each bite offers successive waves of buttery toffee, bitter chocolate and nutty dust. “We have a hard time keeping it in the store,” says a clerk at Dan & Whit’s, a general store in Norwich. 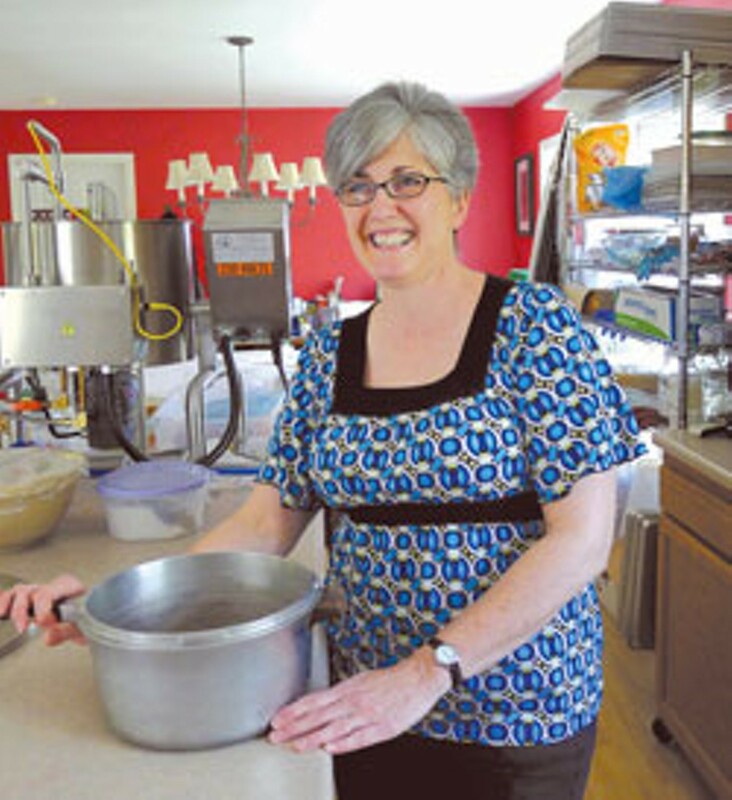 McCabe eventually added King Arthur Flour and the Vermont Country Store as clients, and she graduated from stovetop hand stirring to the metal fire mixer that stands at the center of her kitchen. During a recent visit, a heaping bowl of walnuts sits on McCabe’s marble-topped work table, and the kitchen’s perimeter holds other accouterments of her business: candy trays, a cooling rack, a temperer and various flavorings. Even with a mechanized fire mixer, McCabe still curdles occasional batches of caramel — easier to do when you’re using fresh butter and cream, she says. “It’s just finicky. Sometimes there is no rhyme or reason to it.” Air temperature and moisture can also wreak havoc with best-laid candy-making plans. “They’re a killer to all candy making,” McCabe laments. Summer, she notes, is a better time for planning than turning out toffee or caramel. In 2010, Red Kite took another retail leap when the McCabes attended a Vermont Fresh Network “matchmaker” event in Shelburne with buyers from various stores. The interest from Whole Foods in Hadley, Mass., was immediate.